As host of the annual DP World Tour Championship European Tour event, Jumeirah Golf Estates rivals the best golfing destinations in the world. The world class clubhouse boasts world class luxurious facilities, including dining and entertainment options, a swimming pool and changing rooms as well as a lounge and retail store. Dubai is among the world's fastest growing holiday destinations, thanks to the ultimate luxury hotels, fine dining, tax-free shopping, and the fantastic climate. 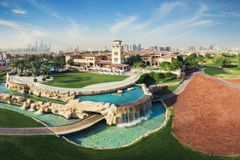 Add a fantastic collection of world class golf courses including the Earth Course at the Jumeirah Golf Estates and you have the recipe for a perfect golfing getaway. As mentioned, The Earth Course has played host to the DP World Tour Championship since 2009 which also marks the European Tour’s Race to Dubai Finale formerly known as the Order of Merit. The DP World Tour Championship has a prize fund of $8,000,000 and in 2018 Danny Willett took home a cheque of over a million dollars for his Tour Championship victory. The victory in 2018 for Danny Willett was an emotional one, with his first victory since earning his Green Jacket at The Masters back in 2016, it had been close to a 1,000 days that he had won on the Tour. This win didn't come easy either, having to chase off the likes of fellow Englishman Matt Wallace, Jon Rahm, and the 2018 Masters champion Patrick Reed. Wanting to improve your performance? For those seeking to improve their game, Jumeirah Golf Estates offers incredible practice facilities complete with one of only two European Tour Performance Institute centres in the world for those seeking the opportunity to see how the world's best golfers fine tune their performance. With a grand clubhouse overlooking the finishing holes on both The Earth and Fire courses, spending some time here before and after your round is well recommended with a choice of excellent dishes to enjoy as well as a host of refreshing drinks to have on the terrace. Jumeirah Golf Estates offers three unique dining options including the Flame Tree Restaurant perfect for steaks and burgers, the Fresca Delicatessen & Cafe for those seeking a lighter dining option and the Swirl Bar & Lounge serving snacks and a wide range of premium beverages. Arrived to play all ,arrangements made by your golf travel ,time etc were spot on. Arrived and checked met by nice receptionist, our taxi had driven to the front door as the bag drop was not well signed. Having checked in we were left completely with no directions at all as to where to go. Going back the receptionist said she would arrange for the clubs to be picked up. After another 5 minutes we had to ask where the buggy and clubs where and directed outside of the club towards steps. On the steps no sign of a buggy but there was a line of buggies about 100 yards away and after asking more directions we were indicated our buggy was one in the far away line. No directions for range or putting green. We then found we were fixed up with a member and if we had not had him we had no idea of 1st tee etc. Once we got playing it was alright and found the course enjoyable. Earth Course was disappointing. There is no comparison to Dubai Creek. Staff were not particularly helpful. Over priced for what you got. Best of all .Quite an experience playing the same course as the final. Greens were still super fast but sadly pitch marked all over ..but we loved the challenge !! Really enjoyed this course. There were 3 of us who played. We were teamed up with a member to make a 4 ball. They were helpful with tips around the course. We booked a 0810 tee but tee'd off at 0840. As the temp was 39* I would recommend as early a start as poss. Was expecting a lot from this course having watched it on TV over the past few years and pleased to say it exceeded these expectations. It is a big course off the back tees (single figures play off the Green Tees which are still over 7,000 yards, the pro tees are 7,500+ yards!) there are some really good driving holes and well bunkered par-3s. The par 5's are reachable in 2 (except the last which is a brute, how the pros reach this in 2 I have no idea) so this is where you need to make your birdies if you are going to get near your handicap. Would go back to play in a heartbeat, really enjoyed it and was a fantastic experience, 5 stars from me.